Heated debate in the riposte’s & the responses ( read the comments in the original- see link below) from the Architectural Record – Like Michael Sorkin says here – it seems a pointless debate – one that is particularly irrelevant here in the global South – we can’t really see whats the “new” in New Urbanism or what is really different in the Landscape Urbanism from what Landscape Architects here have always done – stewarded the environment on which we all depend – and try to get their clients to do what’s best for all the actor-networks involved in the city, human & non-humann – wealthy as well as the disenfranchised- not just themselves . A recent book by New Urbanist authors revives an old battle with Landscape Urbanism. 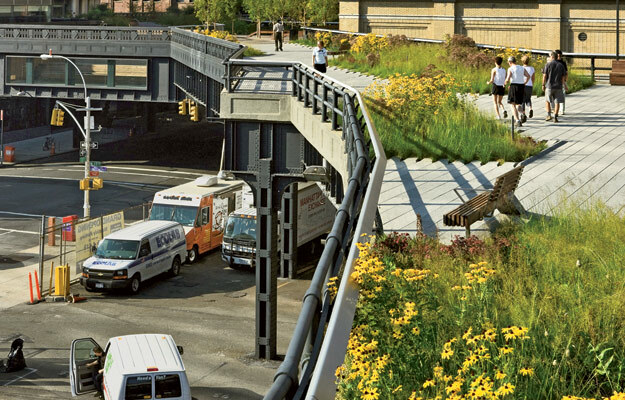 The High Line in New York, designed by James Corner Field Operations with Diller Scofidio + Renfro, is criticized by Andres Duany for being too expensive and over-designed. It’s hard to keep up with the musical deck chairs in the disciplines these days. The boundaries of architecture, city planning, urban design, landscape architecture, sustainability, computation, and other fields are shifting like crazy, and one result is endless hybridization–green urbanism begets landscape urbanism, which begets ecological urbanism, which begets agrarian urbanism–each “ism” claiming to have gotten things in just the right balance. While this discussion of the possible weighting and bounding of design’s expanded field does keep the juices flowing, it also maintains the fiction that there are still three fixed territories–buildings, cities, and landscapes–that must constantly negotiate their alignment. 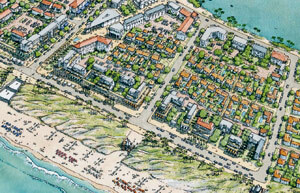 Duany Plater-Zyberk & Company, one of the leading firms in the New Urbanism movement, designed a master plan in 2012 for Costa Verbena in Brazil. The designers say the plan respects the site’s topography and its sensitive ecosystems, while applying a traditional street grid. Related Links:Andres Duany and Emily Talen Respond to Michael Sorkin’s Review of Landscape Urbanism and its Discontents: Dissimulating the Sustainable City. Here in Cape Town our mayor Patricia De Lille is wreaking havoc on a the cities food security by allowing development in an area of of agricultural food production within the cities urban boundary – the Philipi Agricultural area, to satisfy political campaign promises to build low-income housing without having to face up to selling urban brownfield sites that can be converted to high-end residential property, with high rates and taxes. rather than mixed -use low income development closer to the cities core, with low rates and a high social security cost to the city. Are politicians any different anywhere – but how does one balance a cities books – the truth is seldom as simple as media campaigns make out! I wonder if this is not "highbrow" (see jury’s coments) – it all depends if the people who come here look like photoshop models – and if so did they model themselves on advertisers photoshop models or what? The cultural and social messages we express through the things we own and wear are driving our current unsustainability crisis, which has led to a wasteful, consumer culture. What would happen if we kept our stuff instead of buying new sh*t every day, week, month, season, year, lifetime etc….? It is great to see the evolution of this thinking moving from a set of rigid principles that are promoted "top-down", as it were, by the "experts, " to a more open engagement with different points of view. In my view, one of the most difficult challenges for sustainable/resilient urban planning and development is for the experts in any field, as well as the politicians, to appreciate the intelligence and "savvy" of locally embedded knowledge. This then means that all of these lists and formulae are only a starting point and that while the process can (possibly) be defined e.g. co-creation, co-design, integral design, transdiciplinary design, whose proponents all have their own sets of design methodologies and use different methods and tools, it seems it is always necessary to engage all the actor-networks that include the living and the dead – the dead are after all not really dead – they live on in the urban fabric, both as the built morphologies we inherit ,as well as the laws, regulations, fences, old freeways and the conditioned preconceptions and desires of the people we so dutifully want to engage and get to participate. It is thus not only futile to think one has the answers, but in fact is a certain recipe for disaster – how many times have the plans been carefully crafted and sent backwards and forwards for public /political consultation etc. etc. and the when the dozers arrive or the hoardings are set up on site, only then is the resistance of hidden threads of diverse actor-networks revealed, be it in corrupt politicians and developers (not all are), invisible publics that were busy elsewhere and never attended the meetings, or conflicts in international relations /economics that come up unseen as it were. By this skepticism of planning’s efficacy, I do not mean to say that we should not have guidelines and processes, but we should realize that everyone (planners included) have self-interest’s, as in the words of former president Nelson Mandela: "(Ubuntu) does not mean people should not address themselves, the question is are you going to do so in order to enable the community around you?" Without a change in how WE do business – it will just become business as usual -so I think that the concepts of "conserver cities" would be more likely to become reality if the truth of the matter were visible to all that and to borrow a little ancient Indian wisdom we understand "Karma" and why we shouldn’t be fouling our own back door – it will be coming back to bite us – after all we all breathe this same air. We live in an era of unprecedented speed and mobility. Urban geographer and anthropologist Manuel Castells has famously characterized our time as being shaped by the “space of flows,” in which multiple communication systems enable powerful and often instantaneous connectivity. Nowhere is the space of flows more manifest than in the extensive and overlapping networks of global air transportation. In the past half century, in the United States and around the world, air travel has progressed from an elite prerogative to a popular option.